When considering the perfect location for a vacation, New Mexico is an excellent choice, especially if you are interested in state parks. 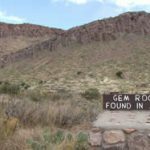 Rockhound State Park is the most interesting of New Mexico’s 35 different sites, because it is one of the very few state or national state parks that actually encourage you to remove rock samples from the site, up to 15 pounds of them. Bring along a hammer, chisel and shovel and explore the beautiful landscape, collecting samples of a very diverse selection of geodes, agate, common opal, quartz crystals, perlite and jasper, just to name a few. However, you do not need to be a rockhound to enjoy this great area, which has an exciting variation of scenery and accommodations. There are many different types of cactus and other desert plants to enhance the beauty of this area. Steep, rocky hills, ravines, dry lake beds, canyons and majestic mountain ranges are part of the scenic landscape. There is an abundance of wildlife, in spite of the desert environment, including lizards, deer, antelope, prairie dogs, badgers, birds and rabbits. Bighorn sheep and even mountain lions are normally only seen at higher elevations of the surrounding mountain ranges. There are even some ghost towns hidden away, awaiting your discovery. Other interesting sites are the remains of earlier gold and silver mining activities. The hiking trails have been planned to provide variation in steepness and climbing difficulty, making it easy for all visitors to enjoy the spectacular views. For the rock hunter, a little information concerning the types of specimens to be collected could be helpful. Jasper, also known as chalcedony, can be found in many different colors, including pink, white, red, as well as gray. It will have to be chiseled from small outcroppings of solid rock, so do not forget the tools. A more abundant specimen is perlite, which is a shiny, glassy, black rock, which is easily chipped loose. One of the exciting specimens to find is the Thunderegg. This is usually a sphere that has two parts, known as the shell and filling, but some are hollow, without the filling. The outer part is pinkish or dark gray and the filling can be composed of agate, jasper or quartz. Geodes are similar to the thundereggs, but are hollow with cavities that are lined with crystal. While specimens can be found over the entire Rockhound State Park area, the most favored area is a shallow ravine on the southern edge of the park. A convenient path loops around the campground for a little over one mile. Rockhound State Park has 1,100 acres and is located in the Little Florida Mountains, just a few miles southeast of Deming, New Mexico, conveniently near the interstate. It actually is two separate areas, consisting of the state park and the Spring Canyon Recreation Area, which is south of the main park. The main park has a visitor’s center, many exhibits, a playground, picnic shelter and numerous campsites, 24 of which have electrical hookups. There are restrooms, showers and an RV dump station centrally located in the camping area. The recreation area, which is on the eastern slopes of Florida Mountain, is just across the valley. It has picnic areas and hiking trails, but is for day use only and provides no camping facilities. If you are not a camping enthusiast, hotels are conveniently located at nearby Deming and Las Cruces, New Mexico. The gate at Rockhound State Park is open from 7:30 in the morning, until sunset, 7 days a week. To reach the entry gate, drive south from Deming on Highway 11 for about 5 miles, then take Highway 141 east for another nine miles. There is no entry fee for pedestrians and bicyclists, but $5 per day is charged for each vehicle. For campers, fees range from $8 to $18 per night for each site, depending on the utilities available. There is never a charge for water hookups, but they are not always available. Helpful representatives can be contacted by phone at (575) 546-6182, for any updates on fees or other information. If you prefer, you can check out their website at www.emnrd.state.nm.us/PRD/Rockhound.htm. Pack the rock hunting tools and comfortable shoes, head to Rockhound State Park and prepare to enjoy some of the best facilities, scenery and rock collecting adventures any vacation could offer.